MADISON, April 1, 2019 — Did you know there are more than 600 manufacturers in Dane County? Some of the products you use every day are made right here in your own community. To promote manufacturing and its careers in Dane County, the Workforce Development Board of South Central Wisconsin (WDBSCW), in partnership with Royle Printing, Sub-Zero, Wolf, and Cove, and Saris, are hosting an open house series in April called How It’s Made In Dane. “We are excited to connect our students and family members to allow them exposure into the advanced manufacturing facilities and career pathways available in the Madison area so that students may make more informed decisions about life after high school,” said Josh Fassl, Director at Dane County School Consortium. Each facility will have staff available to give tours and answer questions about the products and available careers. Upcoming open houses will be held from 4:00 – 6:00 p.m. and include Royle Printing (745 South Bird Street, Sun Prairie) on Wednesday, April 3; Sub-Zero, Wolf, and Cove (6061 Basswood Drive, Fitchburg) on Tuesday, April 9; and Saris (5253 Verona Road, Fitchburg) on Thursday, April 11. Attendees can pre-register for the tours at howitsmadeindane.eventbrite.com. Open house attendees can also find out how to win a prize form the three companies by registering for one or more open houses. Prizes include a Bones Trunk Rack for transporting bikes from Saris, a game and movie basket from Royle Printing and a Wolf gourmet product form Sub-Zero, Wolf, and Cove. 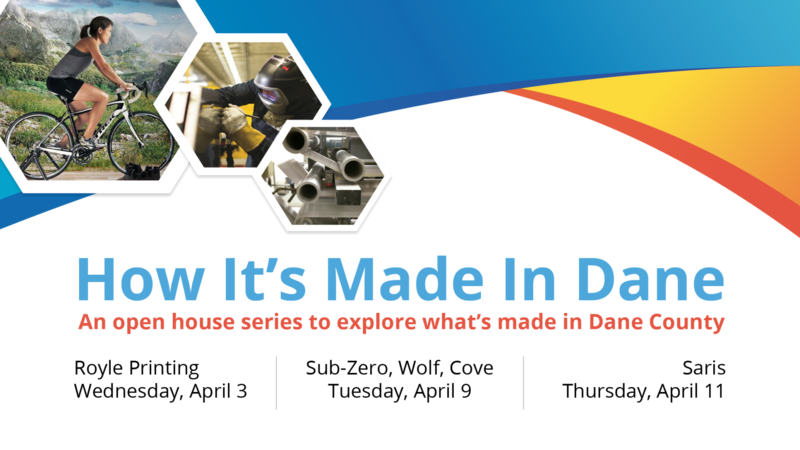 The How It’s Made In Dane open house series is part of the Manufacturing Works campaign for Dane County. The campaign was created in 2018 in partnership with the Dane County School Consortium and the Madison Metropolitan School District to promote careers in manufacturing through posters, presentations to high school staff and facility tours. For questions about the open house series, contact Danica Nilsestuen at 608.249.9001 or gro.wcsbdwnull@neutseslind.